Check out my review of the 2018 Editor’s FabFitFun Box to see what you will receive! *Regular price $49.99. Valid for new customers purchasing Seasonal Subscription Editor’s Box only; not valid for Annual Subscription. CA, NY, and WA sales tax and shipping fees to Canada, AK, and HI may apply. Offer expires on May 6, 2018 at 11:59 p.m. PT. While supplies last. Cannot be combined with other offers. Love With Food is having a flash sale! Now through Monday April 30th, you can save on both on their Tasting Box and Deluxe Box! 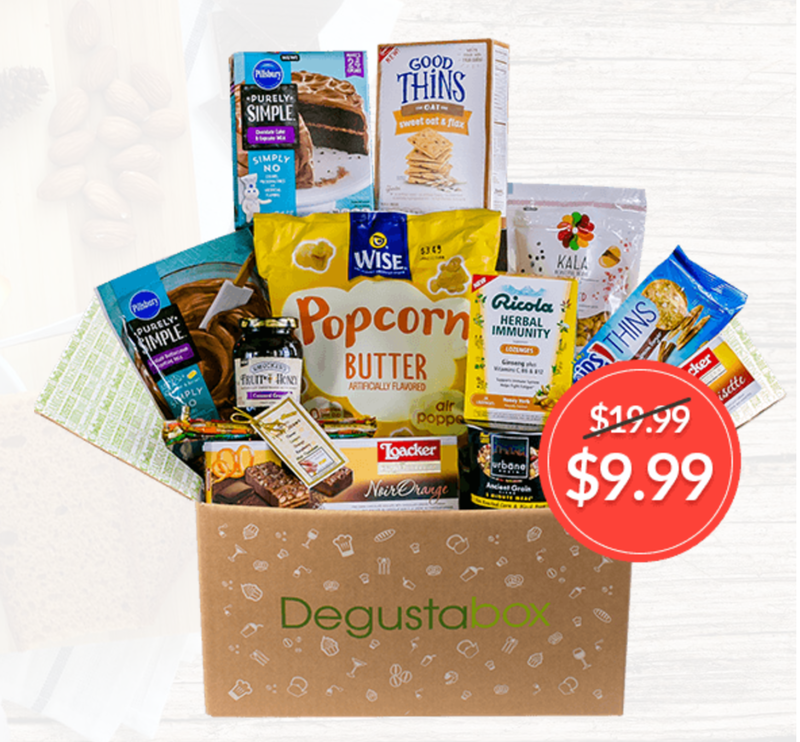 Tasting Box: Use coupon code MSATASTING to get a 6-month subscription for the Tasting Box for $34 – only $5.66 a box! (It’s regularly $51 for a 6-month subscription, or $8.50/box.) Sign up here! Deluxe Box: Use coupon code MSADELUXE to get a 6-month Deluxe subscription for $71.96 – a total of $11.99 a box! (It’s regularly $107.94 for a 6-month subscription, or $17.99/box.) Sign up here! Check out our Love with Food Tasting Box reviews to learn more about this subscription! Loot Anime has a new deal until the close of the April crate! Until April 27th at midnight EST – use coupon code QUIRKIT a save 20% off of Loot Anime! Check out our Loot Anime reviews to see what’s been in past boxes! Now through 4/29, use coupon code RESPONSIBLE20 to save 20% off your order from The Bouqs! The Bouqs subscription is a flower delivery service. They send fresh cut flowers to you or a friend as often as you’d like. You can set your deliveries every week, every 2 weeks, every month, every 2 months, or every 4 months. Plus, you’ll choose your Bouqs aesthetic (“The Farmer’s Market”, “C’mon Get Happy”, “War of Roses”, or “Bouq-tastic Voyage”) and the size of bouquet you prefer (Original, Deluxe, or Grand). Check out our review of The Bouqs to see what you can expect from this subscription! Ellie is a workout wear + gear subscription. When you subscribe, you can choose from the 3 item ($39.95) or 5 item ($49.95) outfits in their current collection. Check out our Ellie reviews to see what you can expect each month! Now through 4/31, use coupon code EXTRABOX to get the March 2018 box for FREE when you sign up for an Emma & Chloe subscription! If you sign up now, April will be your first box. The Parisienne Bangle was featured in the March box – check out the review to get a closer look! The BOGO deal from the Honest Company is back! Now through 4/29, use coupon code BUNDLEBOGO to get your 2nd Honest Company essentials bundles for FREE! Just purchase your first bundle today, enter the coupon at checkout, and your next bundle will be free! Your first box will be the Spring 2018 Box; read our full review to find out what’s inside! Check out all of our Breo Box reviews! Check out our Onxybox Reviews to find out more about this subscription! Full details: Coupon is one use per customer. Coupon is for new subscribers only. Or, use coupon code GBOX3 to save 10% off a 3-month subscription! Your first box will be the April GlossyBox. Check out the April 2018 GlossyBox spoilers to see what you will get with your first box! KiwiCo has an exclusive deal for MSA readers! For a limited time, use this link or coupon code MSACricketBundle50 to save 50% off the sale price of the Newborn Pack! Building a loving bond with your baby lays the foundation for learning. A soft swaddle blanket provides a touch of comfort & security. Visual stimulation with cuddly sea creatures helps your baby to learn, discover, and develop. The stuffies double as a mobile or stroller toys. Now through May 12th 2018, use coupon code MOM20 to get 20% any length Piquant Postsubscription! If you sign up now, your first box will be the “Oh! Happy Day!” Spring Box – check out spoilers here! For a limited time, use coupon code MSA20 to save $20 off the Spring Box of Style! (Regularly $99.99) This code can be applied to the quarterly or annual subscription. Dinnerly is the most affordable meal kit subscription box, at just $5 per serving. It was created for people who like homemade cooking, but don’t like overpaying for the good things in life. They use the same quality ingredients as other meal kits, but keep the cost low by taking a simpler approach: digital recipe cards instead of paper, fewer ingredients per dish (which means less chopping and cleaning), simple packaging, and no fancy marketing campaigns. Check out our Dinnerly Reviews to see what you can expect from this box! Full details: Only valid for new customers. Get free shipping on your first AND third orders only. Valid until 05/01/18. Cannot be combined with other offers. T&Cs of Marley Spoon Inc apply. I tried MSA15 on Breo Box & it’s a $15 discount, not $40. Are you sure that’s the right code? It would be surprising if it was gone in 2 Days… Thanks! Ecocentric Mom has a great deal for $10 off right now making their mom only product box &17.99 free shipping. It’s only the first month but their boxes are great. Thanks for letting us know! What’s the coupon code? The code is MOMSDAY10 it will work on their mom and baby boxes too but their mom only boxes are great whether you’ a mom or not.